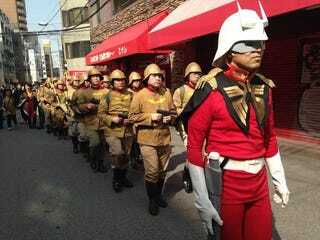 Over the weekend, Osaka's geek district of Nipponbashi was closed to cars, with the main drag turned into a giant gathering of cosplayers, photographers, and fans. March 21 was the 11th annual Nipponbashi Street Festa, and some of the photos don't give a very good idea of just how crowded the day gets. For example, you might be able to see there are lots of people in these photos. Have a look at some of the standout cosplayers.